The small plane took off hesitantly from Glasgow Airport as if uncertain of its flight path even as I clutched at my seatbelt in panic mode. The eight other passengers were already fast asleep though it was only noon. The smell of beer fumes filled the tiny space, making my head spin as I looked down at Scotland’s receding coastline. The sea gleamed below like a sheet of pale-blue glass, dotted with tiny boats that looked like toys. We were heading to the Outer Hebrides, an island chain off the west coast of mainland Scotland. My friends were excited about fishing for sea trout and I was looking forward to some bird watching. Neither of these happened, but more on that later. 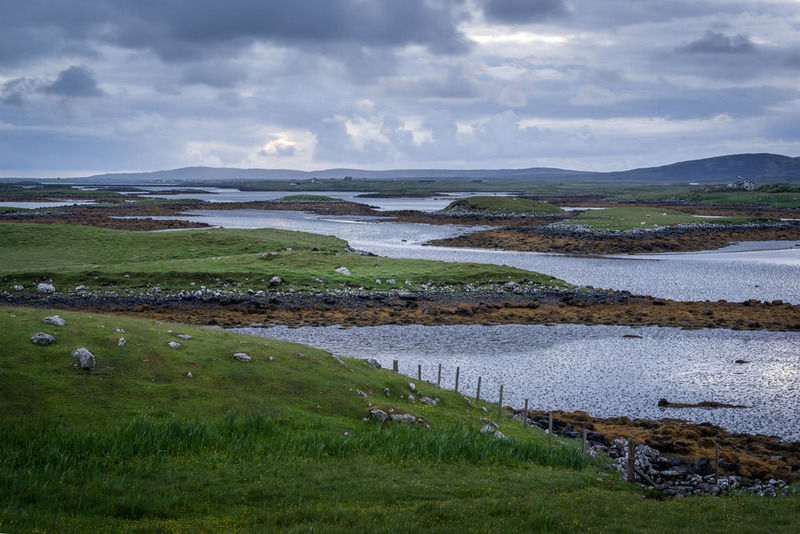 We landed on the island of Benbecula after having hopped like kangaroos on various smaller ones with lyrical names, verdant green meadows and lakes, but hardly any human population. We drove towards South Uist on a lonely, perfectly smooth road, running into traffic jams with herds of sheep and then finally reached the small inn where we were to stay. The village of Daliburgh, within the vicinity of the historic Askernish Golf Club, had never seen anyone from India and soon we had a curious crowd coming in for drinks and a viewing of the exotic Indians on display. By late evening we had made many islander friends and each one had a wonderful story to narrate about this remote, un-spoilt region with its unique Gaelic culture. Out for a walk the next day, I was surprised to see that there was not a single person around though it was bright and sunny. “Lazy people!” I thought to myself and began walking at a brisk pace. The sky in Outer Hebrides is like none I have ever seen. It hovers over your head like a giant, gleaming upturned bowl of silver and gold and the horizon seems to stretch to the ends of the world. Vikings, it would seem, loved this remote place also called the Innse Gall or ‘islands of the strangers’ and archeologists have found more than 200 ancient settlements here as well as Bronze Age roundhouses with human skeletons. In fact, the only two prehistoric mummies to be found in Great Britain were excavated from this area. As I walked along, admiring the stunning, surreal landscape, I heard a strange, low, humming sound and turned around to investigate. It was the wind making its way towards me. The few shrubs along the path bowed almost to the ground as the wind ploughed its way, creating waves on the grassland. Within seconds, I was almost blown off my feet and had to run to seek shelter under a prehistoric stone archway. I learnt later that if you were to ask the islanders for a weather forecast, they will not answer that it will be dry or wet or sunny; they will tell you the wind factor — its speed and strength. An elderly resident of Daliburgh told me that she had once seen hundreds of tiny fish flying out of the lakes during a particularly fierce storm. “We ate fried fish for weeks,” she recalled. South Uist’s dangerous winds however, help the machair (fertile plain), a strip of shell-sand grassland made over thousands of years, to flourish. These fields of golden grass are covered with hundreds of wild flowers and often shelter rare birds. Not daring to face these ferocious winds again, I drove around in a jeep but saw only a few ringed plovers and a group of Greylag geese. “Where have all the birds gone?” I asked my guide, a taciturn man who smoked relentlessly “to keep the nasty midges away”. He pointed to the empty, sapphire blue lake and said, “We have eaten them all — geese, ducks and swans,” even as he blew smoke to chase a cloud of insects away. I was not sure whether he was joking but I learnt later that there are 130,000 pairs of puffins on an island nearby. I just happened to miss sighting even a single pair but there were otters frolicking in the blue waters of the lake and a few hedgehogs that kept crossing the road. “We are paid by the local authorities to help our hedgehogs get safely to the other side of the road without being run over. One pound per hedgehog is the going rate,” said my guide with a twinkle in his eyes. Since my fishing friends had had no luck, we headed off to the island of Eriskay. This jewel became famous after Whisky Galore was filmed here in 1949. The story is based on an incident that took place in 1941 when a ship was half-wrecked on its shores and all the fishermen from Eriskay went out in their little boats to salvage the hundreds of bottles of whisky the ship was carrying. Later, they generously distributed the bottles to each house on the island. A golden eagle flew above us as we walked along the lonely beach which stretched for miles, almost merging into the blue sky. The cruel wind was lying low for the moment. We ate fresh fish caught, not by my friends but by the local fishermen who were intrigued to meet people from India. “There is a great Indian restaurant in North Uist and we take our boats there in good weather and get chicken curry back for our friends,” they told us. A unique takeaway system but it seems to work. The only shop on the island sells beautiful, hand-knitted sweaters and when I admired the intricate patterns I was told that in olden days each family on the island had its own unique sweater design. “How original and creative,” I exclaimed. “Yes, it helped to identify the bodies when they were drowned,” replied our shopkeeper with a gentle smile. The seagulls called in raucous tones as we headed back to our island. 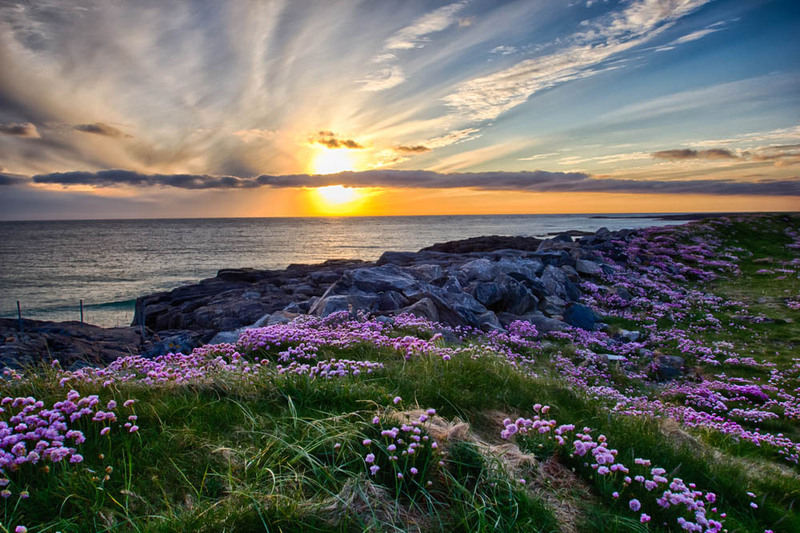 The machair glittered with hundreds of new wildflowers that had sprung up suddenly to greet the late afternoon sunlight. The sky had changed colours and now appeared pink and grey. As we watched, a giant sun began to set over the horizon as the pristine, golden beaches waited for the sea to come in. It seemed to us that we were poised on the edge of the world, the last survivors on this lonely, empty land. And then we remembered we were from India and felt relieved. Suddenly, without warning, the wind began to sing its eerie song and we rushed back to seek shelter in our warm inn and bask in the company of our new-found Hebridean friends.